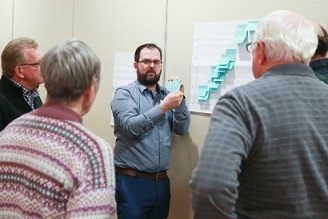 We wanted to give a group of Ontarians the opportunity to be more deeply engaged in the process of coming up with the list of ideas which went to public voting. That’s why we organized public, in person workshops. 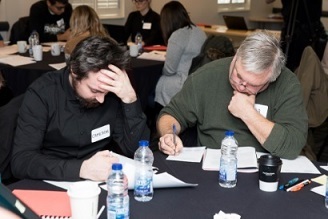 Over three weekends in November and December 2017, we recruited panels of up to 28 Ontarians to participate in workshops in four cities across the province: London, Ottawa, Sudbury and Toronto. Panels were recruited from the pool of registered users on the Budget Talks site who said they were interested in participating further. We made sure that these panels were representative of Ontario’s population, and that nobody faced barriers to participating. For a full day, panelists discussed and considered ideas that others had submitted online. Their recommendations produced the list that was put forward for a final public vote. We wanted to make sure people had time to read, think and discuss ideas before coming to their final recommendations. 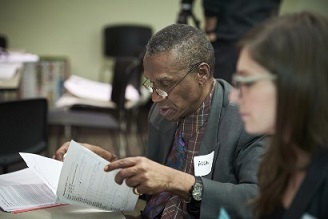 Each workshop reviewed a list of 82 ideas that we determined had met the submission criteria. Their job was to help us prioritize these ideas, and help whittle them down to a shortlist for public voting. Developing evaluation criteria: We asked panelists to agree on how ideas would be evaluated. As a group, we defined how we would rate each idea on three criteria: inclusivity, reach, and importance. Inclusivity: Is it possible to apply this idea in a way which can include Ontarians who might otherwise be excluded or marginalized? Reach: To what extent does the idea have the potential to impact a significant number of Ontarians? Importance: Overall, how important do you think this idea is to Ontarians? Consider its impact on your community, your region, or to the entire province. Reading, discussing and rating ideas: We organized panelists into small groups to read and discuss each idea, agreeing on ratings for each. Each group had to evaluate a quarter of all the ideas. Presenting the short list: Once they had counted their scores, each group presented their top ideas to the larger group. They shared their thoughts on why they rated these ideas highest against the three criteria. Voting - Everyone in the room was given ten stickers which they could use to vote for the ideas they think should proceed to the next stage. All the top ideas from the tables were put up on the wall for people to read and consider. At the end of the workshops in the four cities, we tallied the votes and sorted the ideas from most to least votes. The Government then selected the final list for voting from among the top 16 ideas recommended by the panelists. The Government deemed these ideas to be consistent with the submission criteria and with the government’s priorities. The Government also took regional preferences into account when creating the top list. This is the list which we put to a final public vote. Voting ran from January 10, 2018 to January 26, 2018. Shortly thereafter, the successful ideas get announced, and periodic updates on their progress get made throughout the year. Want the full dataset describing the results of the public workshops? We surveyed panelists before and after the events, to gauge their satisfaction and gather feedback about how to make the process better in future. You can read the summary below, or send us an email at financecommunications.fin@ontario.ca if you would like to obtain a copy of the final evaluation report. For many panelists, this was their first time participating in a public consultation, and the vast majority had not participated in Budget Talks in the past. When asked why they chose to be a part of the consultation, they told us that they wanted to learn and contribute to the budget process. 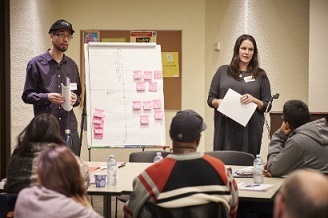 Many saw their involvement as being an act of citizenship, and felt that they were being given an opportunity to help influence a part of the Ontario budget, even if it is a small part. Some participants felt they should have been given more information to help make their decisions. A few said that they found the quality of proposals to be lacking. Overall, 84% found their participation to be meaningful, and most found that the sessions were constructive, respectful and valuable. A majority felt they had learned more about issues affecting their communities. We asked panelists to explain in their own words why they wanted to be a part of the Budget Talks consultation. Below are a selection of quotes from participants who answered this question.